The M-Link IRC Gateway enables connections between IRC and XMPP servers. The Gateway operates by associating IRC Channels with XMPP Multi-User Chat (MUC) rooms hosted on the Gateway. The MUC rooms can be assessed by XMPP users on connected XMPP servers and by IRC users on connected IRC servers. The Gateway maintains an IRC connection for each MUC room member and sends messages to the IRC channel on an appropriate link. Connections are shared between (gatewayed) MUC rooms. Incoming messages from IRC will arrive on each link, and the Gateway will ensure that just one message is distributed to the MUC room. The M-Link IRC Gateway uses the IRC Client/Server protocol to connect to IRC, in order to maximise interoperability with different IRC servers, and the standard XMPP Server/Server protocol to connect to XMPP servers. Management tools (such as Isode MLC) which make use of the Client/Server protocol can connect to the M-Link IRC Gateway for the purposes of configuring and monitoring the system. No other use of this protocol is supported, in particular the M-Link IRC Gateway does not support directly connected users. The involvement of IRC is totally transparent to the XMPP user. The user will see a normal MUC room, which just happens to be connected to an IRC channel. Full MUC functionality is available locally, for example MUC access control and affiliation management. There is no downgrade of security for XMPP users with XMPP traffic. XMPP users are still authenticated and connections are protected with TLS. M-Link security label support is available, including translation to IRC users as FLOT labels in the IRC messages. The XMPP administrator has control of MUC room naming, which does not have to match IRC channel naming. Management of the MUC rooms connected to IRC and management of the connection is done using M-Link's management GUI, M-Link Console (MLC). 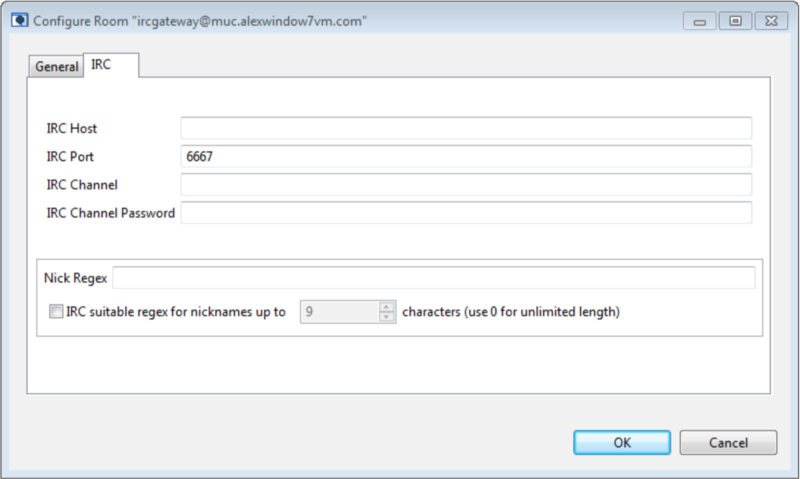 MUC rooms set up for connection to IRC channels can be configured with all of the security and access features available to standard XMPP MUC rooms in M-Link. IRC is widely used on military networks. Many military networks wish to upgrade from IRC to XMPP, and the approach taken by the M-Link IRC gateway facilitates this. With the M-Link model, an XMPP MUC room is created to match each IRC channel. As users move from IRC to XMPP they can be added to the XMPP MUC room. When no IRC users remain, the IRC channel can be turned off, a process that will be completely transparent to the XMPP users.